The holiday season is starting, Christmas, New Year, Chinese New Year and other festivities are on their way. Many go back home to visit family, other’s travel abroad for an escape holiday trip. No matter how you spend your holidays, studying might be the last thing in your mind. But taking a long break from classes is an easy way to forget some of the vocabulary and phrases you have worked so hard to learn. Here are some relaxed study tips you can follow to both enjoy the holidays, but also keep on learning Chinese. Tips: Listen to one podcast per day, for example before going to bed, in the car or when taking public transport. Watching Chinese movies can bring you the language environment while also relaxing on a vacation. If you are inside China, you can find a large variety of movies on Youku.com. For beginners I recommend the original Happy Chinese series that consists of short episodes geared towards foreigners learning Chinese. I used to binge watch it during my first years in China. Tips: When you aren’t in the mood for real studying, relax with the right language environment and hop on to Youku and its endless options of video entertainment. Perfect for lazy days on the bed. WeChat is the hottest and biggest app in China, combining features like WhatsApp, Facebook and many many more. It’s an educational tool as well! I have set up a group for Chinese discussion where you can practise your Mandarin by typing pinyin or characters. You can also send voice messages to practise your spoken skills. The fee is only 100CNY per month and if you want to join us, just send me an email! Tips: Besides joining my discussion group, you can also follow many other learning resources and Chinese articles on WeChat. Try to chat or read a bit in Chinese every day. 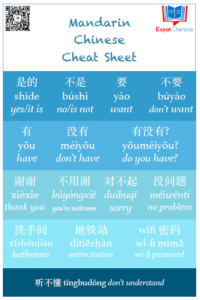 All of us enjoy some time off work and studies, but there are easy ways to keep Chinese in your life even on a vacation. Find the way that suits you the best or try different things according to your mood of the day.